The TIMSS 2011 International Database is available to all individuals interested in the data collected and analyzed as part of TIMSS 2011. The aim is to support and promote the use of these data by researchers, analysts, and others interested in improving education. The database is available for download on this page. For the TIMSS 2011 fourth grade assessment, the database includes student achievement data as well as the student, parent, teacher, school, and curricular background data for the 52 participating countries and seven benchmarking entities. For the TIMSS 2011 eighth grade assessment, the database includes student achievement data as well as the student, teacher, school, and curricular background data for the 45 participating countries and 14 benchmarking entities. The student, parent, teacher, and school data files are in SAS and SPSS formats with programs and macros. The entire database and its supporting documents are described in the TIMSS 2011 User Guide (Foy, Arora, & Stanco, 2013) and its four supplements. The data can be analyzed using the downloadable IEA IDB Analyzer, an application developed by the IEA Data Processing and Research Center to facilitate the analysis of the TIMSS and PIRLS data. 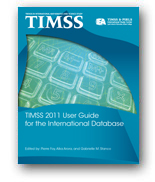 Some contents of the TIMSS 2011 International Database are available in Portable Document Format (PDF). If needed, click here to download Adobe Reader® to read and print these materials.